Two independent studies, by Landgren et al. and Weiss et al. , addressed whether MGUS is consistently present prior to a diagnosis of MM. Landgren et al. tested pre-diagnostic serum samples from 71 subjects who developed MM. Samples were available up to 10 years prior to the diagnosis of malignant disease. Using serum protein electrophoresis (SPE), serum immunofixation (sIFE) and sFLC analysis, it was shown that >80% of patients had detectable monoclonal protein ≥8 years before diagnosis, increasing to 100% 2 years before diagnosis. In approximately half of the patients who went on to develop MM, the involved/uninvolved sFLC ratio (defined as κ/λ in κ patients and λ/κ in λ patients) showed a year-by-year increase, whilst ratios in the other half remained largely stable. This is an important observation since an evolving MGUS phenotype (in which the monoclonal protein shows a steady increase, Figure 13.9) has been shown to identify patients with a high risk of malignant transformation . For example, Rosinol et al. reported transformation rates of 55% and 10% at 10 years of follow-up for evolving and stable phenotypes respectively. In a separate group of patients, Weiss et al. demonstrated that 27 of 30 MM diagnoses were preceded by MGUS. Monoclonal proteins were identified by SPE and/or IFE in 78% of patients and by an abnormal κ/λ sFLC ratio alone in 22% of patients. Of the 3 patients who had no MGUS detected, one patient with IgG myeloma had only one pre-diagnostic serum sample available at 9.5 years before diagnosis. The remaining 2 negative cases were IgD myeloma with sera available only 3 and 5 years before the diagnosis. Similarly to Landgren et al., the authors found that substantial increases in the involved sFLC ratio may precede the diagnosis of MM, with or without a corresponding change in the monoclonal intact immunoglobulin. It was notable that, in all four patients diagnosed with LCMM or NSMM, the disease evolved from light chain MGUS. In a third study, also by Weiss et al. and comprising 20 patients who went on to develop AL amyloidosis, MGUS was detected prior to diagnosis in all cases. A median of 3 pre-diagnostic samples were obtained up to 10 years prior to diagnosis. The monoclonal protein type was FLC in 55% of cases, and intact immunoglobulin in 45% of cases. The prevalence of MGUS was 100%, 80% and 42% at <4, 4 to 11, and >11 years prior to diagnosis. Taken together, these findings confirm that a pre-malignant MGUS phase exists prior to disease emergence in most MM and AL amyloidosis patients. IgA and IgG MGUS typically progress to MM or AL amyloidosis, while IgM MGUS is more likely to progress to WM, non-Hodgkin lymphoma or AL amyloidosis, and less commonly, IgM MM . In one study by Hajek et al. , just 1 out of 260 (0.4%) IgM MGUS patients progressed to IgM MM. 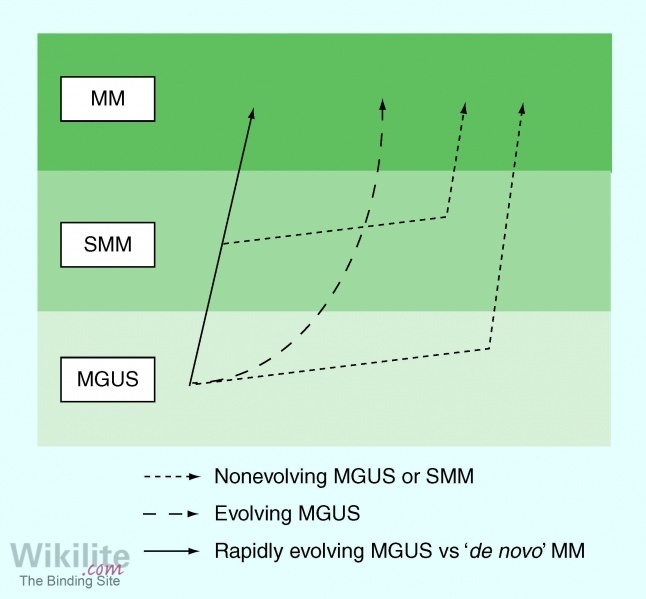 In a review of MGUS as a precursor condition, Weiss and Kuehl  included a model illustrating different patterns of MGUS progression comprising: non-evolving, evolving and rapidly evolving (Figure 13.9). Measuring sFLC levels in routine MGUS follow-up may help to identify patients, with an evolving phenotype, who are at a higher risk of progression to malignant disease compared to patients with stable MGUS.